Channel Letter Installation: Flush Mount or Raceway Mount – Which Is Best? Channel letters are among the most frequently chosen building signs. They expertly translate your company name’s font into a branding message. If you have ever wanted to learn about channel letter installation for Charlotte, NC, building fronts, you are in for a treat. Since we get many questions dealing with exactly this issue, we have put together some information that touches on the most important points. When you call us to order channel letters for your business, we always like to come out for a site survey. Doing so helps us to ensure that we give you the right suggestion concerning display heights. But it also allows us to get up close and personal with your façade. At the end of our survey, our technicians will suggest one installation method over the other. There are usually three reasons why we might recommend a raceway mount over a flush mount. 1. Crumbling facade. If your building’s wall is in bad shape, it is best to minimize the number of holes we have to drill. 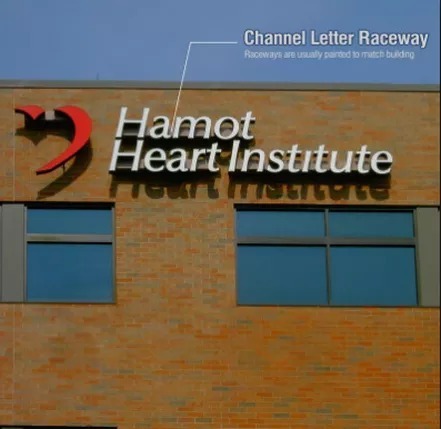 When you consider that the average raceway requires only about three holes whereas the typical channel letter alone calls for three to five holes, it makes sense to suggest the raceway. 2. Thick walls. Old buildings, in particular, may present with foot-deep walls. Sturdy and ideal for minimizing noise from the exterior, this thickness takes a long time to drill through. If you are keeping a close eye on the budget, a raceway install may be cheaper. 3. Impossible access behind the facade. If there is no access to the back of the façade, it is nearly impossible to install the channel letters with a flush mount. Sure, you could hire someone to move the building’s air conditioning unit temporarily, but is this really a step you want to take every time a letter needs to be serviced? In a typical flush mount setup, we measure the spaces between the letters and mark them on your façade. Next, we drill the three to five holes needed to mount the letters. Our technicians fish the wires through the holes before securing the individual elements. Finally, we finish the electrical part of the channel letter setup behind your building wall’s front. Should any letter ever need to have a light source replaced, we can service it from behind the wall. The raceway is a slim rectangular setup that is sufficiently broad to hold your letters’ wiring and any electrical components. As we mentioned previously, it usually takes three drill holes to mount this setup, but sometimes we drill an extra one if the sign is unusually large and heavy. Building owners usually like this option best because it does the least damage to the façade. The letters mount to the front of the raceway, where we space them according to your specifications. We employ our perfect color match technique to ensure that the raceway blends in with the look of the building’s front. So, what is the best channel letter installation in Charlotte, NC? There is no hard and fast answer. Contact us today to invite our technicians to come out and survey your building to find out what the answer would be for your business.